Keeno (left) and Levi (right) explore their new enclosure at Zoodoo zoo. The Serval cat might not be as widely known as their distant relations, the Cheetah, but these wild cats are some of nature’s most successful hunters. 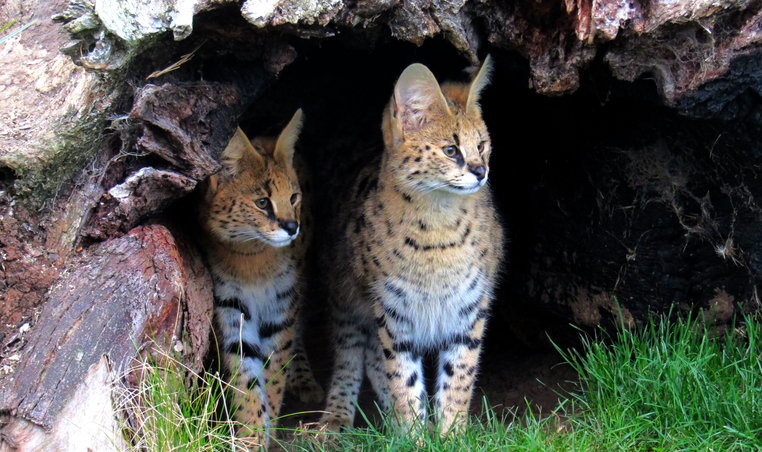 The Serval cat is native to Africa and can often be found near wetlands and savannahs. Known for their long legs, extended necks and rotating ears, the Serval is highly evolved to hunt in the long grasses and reeds with its perfect spotted camouflage. Last month Jetpets had the pleasure of transporting not one, but two of these amazing animals. The male Serval cats, Keeno and Levi were flying out of Melbourne airport and were on their way to their new home at Zoodoo Zoo in Tasmania. 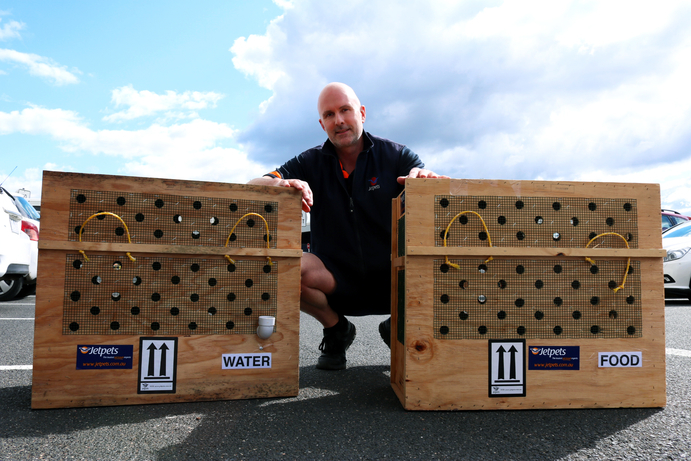 The Servals flew in style with special travel crates that allowed them to view their surroundings, receive plenty of airflow and have access to a constant supply of fresh water. Jetpets Pet Handler, David Garvey poses for a photo while checking on Keeno and Levi before their flight. The Servals destination was a purpose-built enclosure constructed at Zoodoo Zoo and has been created to meet the Servals every need with large logs, tall branches and numerous high up ledges, perfect for perching on and sunbathing. “Keeno and Levi have adapted to their new surroundings exceptionally well and both were eager to explore their enclosure and climb trees and branches when first released. 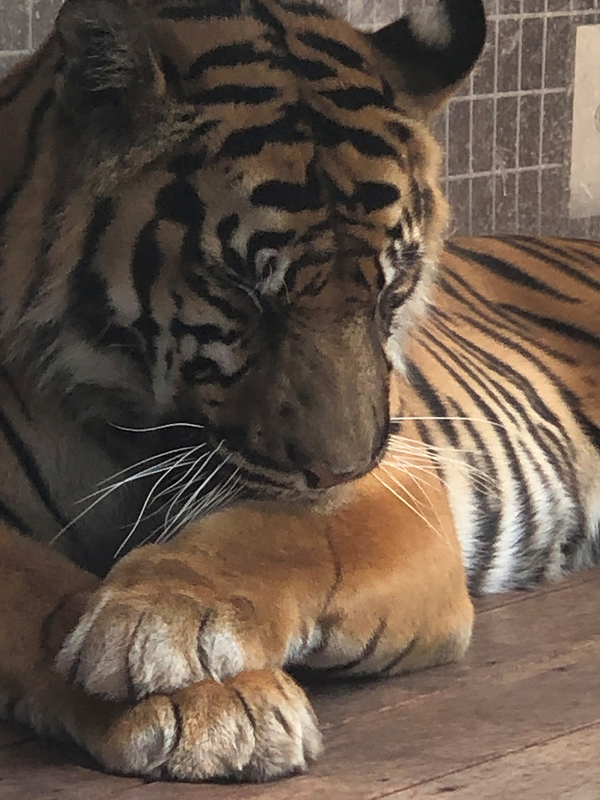 The two boys will eagerly approach staff to receive lots of pats and cuddles and cannot resist playing with the toys they always bring too”, Elyshia Wignell, Exotic Animal Leader at Zoodoo Zoo. Levi (left) and Keeno (right) explore their new enclosure after their flight from Melbourne. 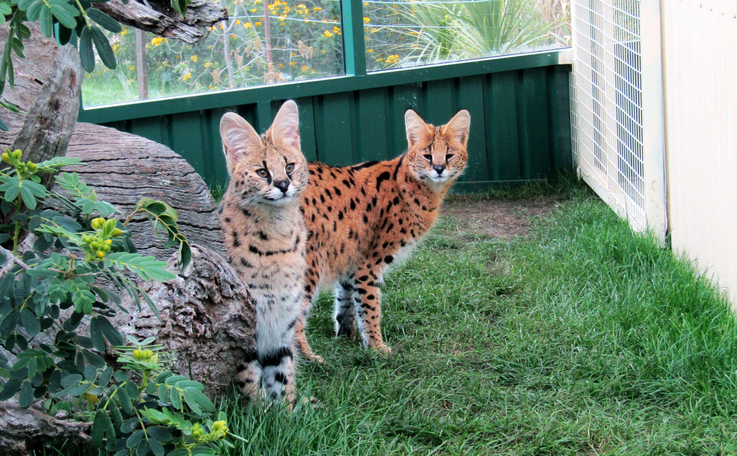 While Servals are often considered solitary animals in the wild these two handsome cats are becoming more accustomed to having company. “Keeno is the more dominant of the two Servals and Levi can be seen sometimes hanging back a little when Keeno is playing with the keepers. However, Levi is very confident, smoochy and absolutely adores attention, said Elyshia. While it is more common for us here at Jetpets to transport cats of the domestic variety, the last 18 months have seen us involved in the transport of two White Lions, Caracals, Cheetahs and even a Snow Leopard. “Our experience with Jetpets was wonderful, from organising the booking, to the animal’s care…we had no problems with the service we received. The entire Jetpets team has been a pleasure to deal with from start to finish and we would have no hesitation with sending or receiving animals through this service”, said Elyshia. Keeno playing among the various logs and perches in his purpose-built enclosure. 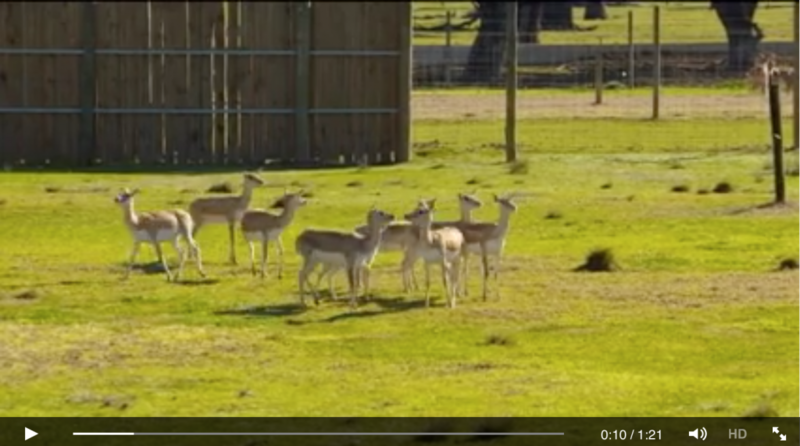 Zoodoo Zoo offers the chance to get up close and personal with a wide variety of animals. 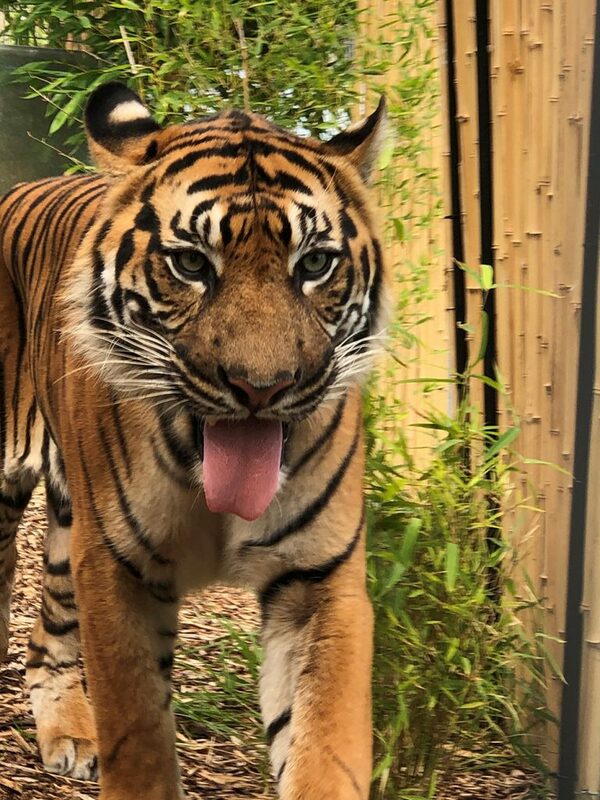 Offering the chance to “get closer to most animals than you ever thought possible”, Zoodoo Zoo is the perfect destination for a fun family animal experience. 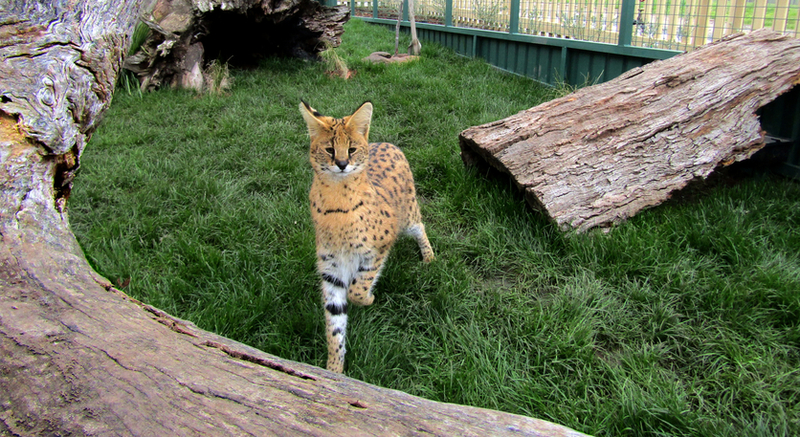 If you would like to have your own Serval experience, please click through to Zoodoo zoo’s website in the link below for more information. Little Sprinter is fast becoming a hero in his home state of Hawaii after undertaking his service horse training. 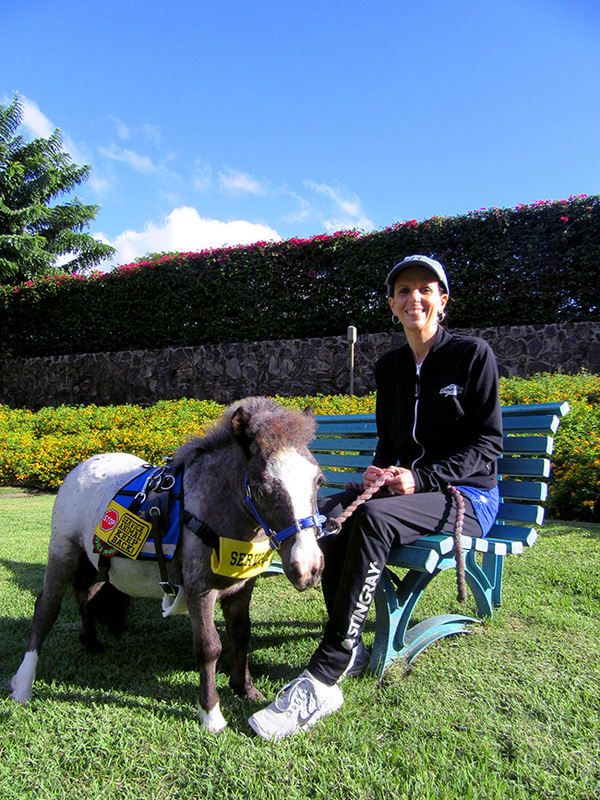 You may remember back in July earlier this year, Jetpets and Pet Express had the pleasure of assisting a special little horse to fly from the windy city of Chicago to the beautiful beaches of Maui in Hawaii. Little Sprinter’s owner Christine Higgins was so thankful for the wonderful service and care given to her new companion that she reached out to us personally to thank us for our involvement. “My little guy arrived in wonderful condition. His eyes were bright and he was relaxed and calm. The trip couldn’t have gone any better!”, said Christine. Pet Express’s Adrienne communicated with Christine throughout the travel process even getting him out of his custom built travel crate and taking him for a walk during his time at our San Francisco transit lounge. 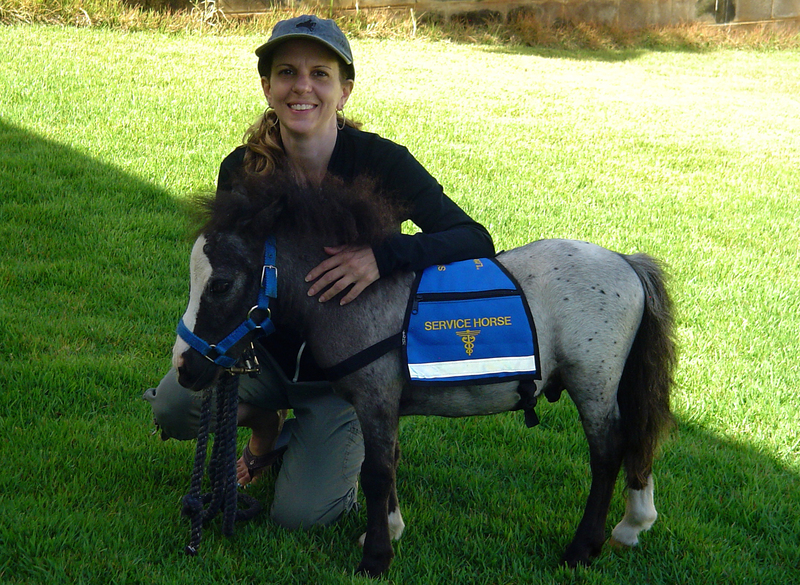 You see Sprinter wasn’t just any miniature horse, Sprinter was purchased by Christine to become a “service horse”. Christine had earlier been diagnosed with Ankylosing Spondylitis, a form of arthritis that primarily affects the spine and joints causing inflammation that can lead to severe and chronic pain. In addition to this Christine was also diagnosed with Lupus, which affects the immune system, forcing the bodies immune system to mistakenly attack healthy tissue. These two conditions, combined with other significant ailments, resulted in Christine having to reduce the physical intensity of her day to day life. Christine knew that she would need some assistance to keep mobile and a companion to keep a positive attitude through this considerable life challenge. Little Sprinter began his service horse training immediately with the aim being that he could provide support to Christine when she travelled to the shops, attended doctors’ appointments and extra stability around the home. Jetpets have kept in close contact with Christine and recently Christine expressed a concern that Little Sprinter was having trouble keeping his balance on the hard wood floors inside her home and asked if it was possible for us to assist. Jetpets committed to help Christine and Little Sprinter by sponsoring special rubber shoes for Sprinter to wear which would allow him extra grip while indoors and provide better stability to Christine. Sprinter with his Jetpets sponsored, rubber shoes which enable him to assist Christine indoors. While Sprinter will no doubt improve the quality of life for Christine’s whole family, Christine wishes to share Sprinters inspirational story with others. “He loads up in the back of my SUV with a ramp. It is my goal to visit nursing homes and hospitals with Sprinter as a therapy horse. I know he will provide so much joy and so many smiles to people struggling like I am”, said Christine. While Sprinter has his work cut out for him assisting Christine and her family and his local community, it’s not all work for the miniature horse. Sprinter gets plenty of time to play in the small paddock next to Christine’s house. His playful personality coming through when playing with his favourite toy, a red yoga ball, which he pushes around the paddock, leaning on it until he falls over only to get up and do it all over again. It’s not all hard work for Sprinter the service horse. 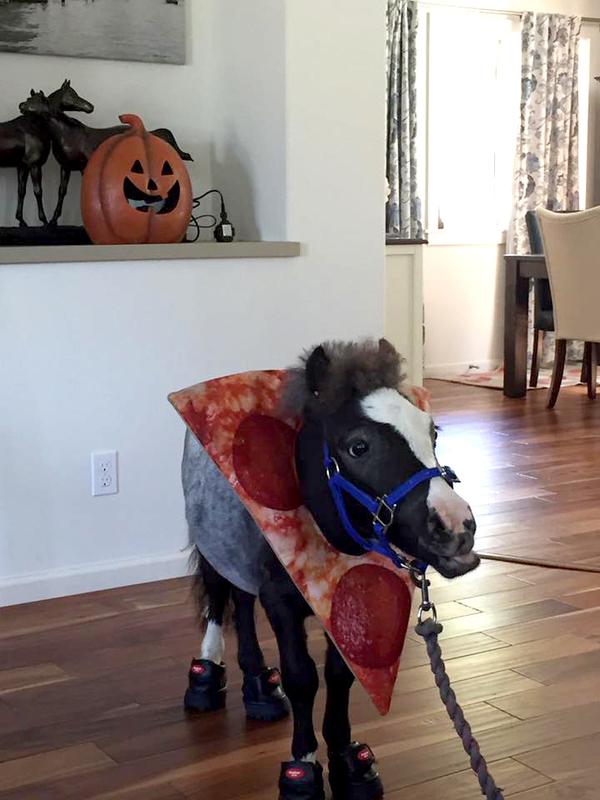 Here he is trying on his Halloween outfit. “He’s quickly becoming my best friend. He’s so sweet and kind. He stays at my side”, said Christine. Although Christine mentioned he also plays up sometimes, “At this point he may be on Santa’s naughty list though!”, she jokes. Jetpets wishes Christine, the Higgins family and Little Sprinter all the very best as they continue to battle Christine’s conditions. We know Little Sprinter will do a fantastic job of looking after her during the festive season and into the next year. If you are interested in following Christine and Little Sprinters adventures, you can do so on his Facebook page which by the way is the most adorable animal page we have seen all year.